MINNEAPOLIS (AP) — Kevin Garnett showed up courtside, and that wasn’t the only surprise in Minnesota on Friday night. 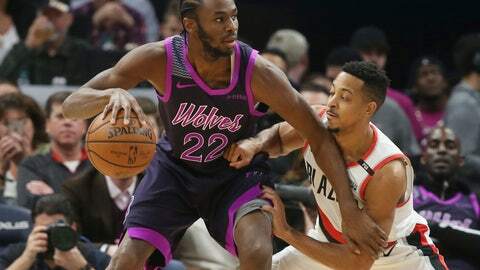 In their first week without erstwhile defensive stalwart Jimmy Butler, the new-look Timberwolves locked down one of the Western Conference’s top teams. Wearing a new purple-and-black alternate jersey on a Prince-themed night, Garnett got the crowd going when the video board showed him sitting below the basket. Then the home team kept them cheering with a defensive effort that would’ve made the Wolves icon — a ferocious defender in his prime — proud. “It was great to see him,” Karl-Anthony Towns said. “It was a long conversation with me and him to get him to come. So I’m happy he came and we played really well as a team. The Wolves entered the game allowed opposing teams to score an average of 116.2 points per game. They held the Blazers — who were averaging 115.9 per game — to their season low. Towns and Robert Covington each had 14 points for the Wolves, who are 7-1 at home and 3-0 since trading the disgruntled Butler to Philadelphia on Monday. Rose cautioned against reading too much into the success. The Timberwolves’ lineup had a balanced night, with all five starters scoring in double figures. It was a stark difference from the last time the teams met nearly two weeks ago, when the Blazers held Minnesota to 81 points — the lowest point total in the NBA this season. The Wolves were without Butler, Jeff Teague and Rose for that game. The Blazers have their first losing streak of the season — not the start they wanted for their six-game trip. CJ McCollum had 18 points and Damian Lillard added 16 for Portland, which never led. The Blazers got within six in the third quarter before Minnesota closed the period on a 21-11 run by attacking the basket. The Blazers committed 18 turnovers, leading to 22 Wolves points. “The ball is in my hands a lot and the team counts on me to take care of the ball and make sure that we get quality possessions. I didn’t do a great job of that,” said Lillard, who had five turnovers. The Wolves debuted their “city edition” uniforms that pay homage to hometown music legend Prince, who filmed his iconic nightclub scenes of the 1984 movie Purple Rain across the street from where Target Center was later built. Prince music played all night. “I know our players are really excited about the uniforms and the night. It’s a great way to honor Prince,” coach Tom Thibodeau said. Trail Blazers: Lillard had five assists to pass Damon Stoudamire (3,018) for third on the team’s career list. He has 3,020 for his career. … G Seth Curry sat out with a bruised right knee from the first quarter of Wednesday night’s loss to the Lakers. Curry said Thursday his goal was to return during the team’s current six-game road trip. Trail Blazers: Visit Washington on Sunday. Timberwolves: Host Memphis on Sunday.